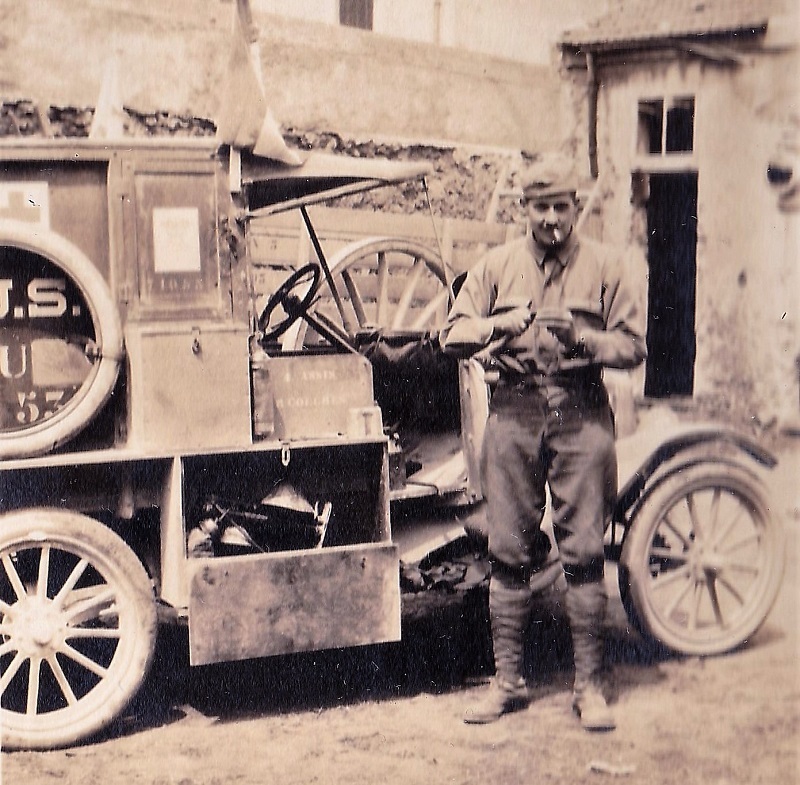 On June 6, 1917 in Amherst, Massachusetts, thirty-one men enlisted in the U.S. Army to drive ambulances in support of the French army. Most of them were Amherst College students but there were some recent graduates (including two young professors). Four others came from the towns of Amherst, Pelham, or elsewhere around New England. One of the Amherst College students was my grandfather, Hugh Hamilton, who kept a diary and saved letters and other items. The official name of the ambulance unit was the Section Sanitaire États-Unis 539 or simply SSU 539. Over time they became known as the Black Cats. After months of research, in May of 2018 I published a book on this topic. It is called The Black Cats of Amherst and is available through Lulu.com. If you have any questions, please feel free to contact me. Follow the @AmherstBlackCats twitter account for ongoing updates. See below for updates related to the book. 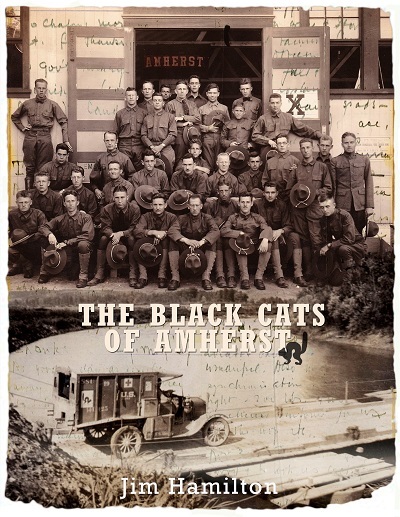 The Black Cat colors: In April of 1919 a group of Black Cats marched from the Amherst train station to the college campus to present their unit colors to the Amherst College president, Alexander Meiklejohn. A large crowd that included Civil War veterans celebrated their return. Today the colors sit in a large flat box in the Amherst College archive. Made of silk with embroidered images, the colors are in very delicate condition and in need of restoration. In the picture below you can see the Black Cat symbol plus references to the operations they were involved in. Fred Waugh uniform: The uniform of one of the Black Cats is in the University of Massachusetts Special Collections & University Archives. As you look at the picture below you can see his awards and unit insignia. Above the upper left pocket is his Croix de Guerre. 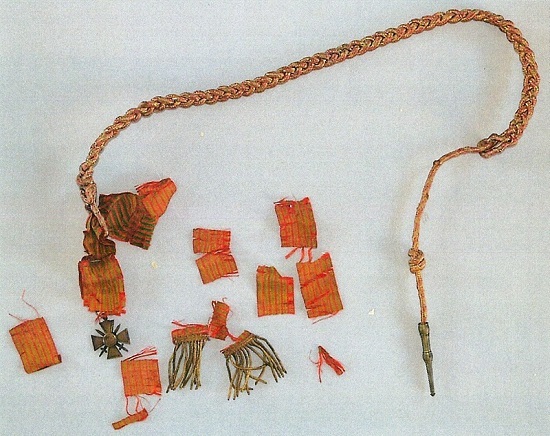 The other decoration is a fourragère, which is awarded to units that distinguished themselves more than once. 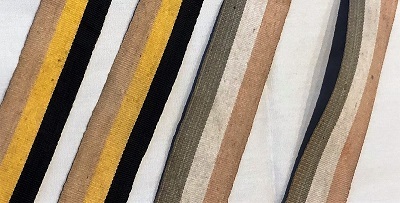 Waugh was a private, and you can see a single private’s stripe on the left sleeve. Out of the picture but below his private’s stripe on the sleeve are three inverted chevrons. The meaning of these chevrons is not clear to me. The unit was involved in three major operations, so perhaps it is related to that. Harder to see in this photograph are the unit insignia on the left arm near the shoulder. The white A in a red circle inside a blue field refers to the U.S. Third Army. A white rooster on a crimson background is the insignia of the ambulance units. November 2017: Several Black Cats kept diaries, at least two of which have survived: Hugh Hamilton's and Stoddard Lane's. Stoddard Lane was quite a bit older than the other Black Cats. A 1909 Amherst College graduate, he was working as a Congregational minister in Bogota, New Jersey prior to the war. He married in October of 1915 but his wife died about a year later. 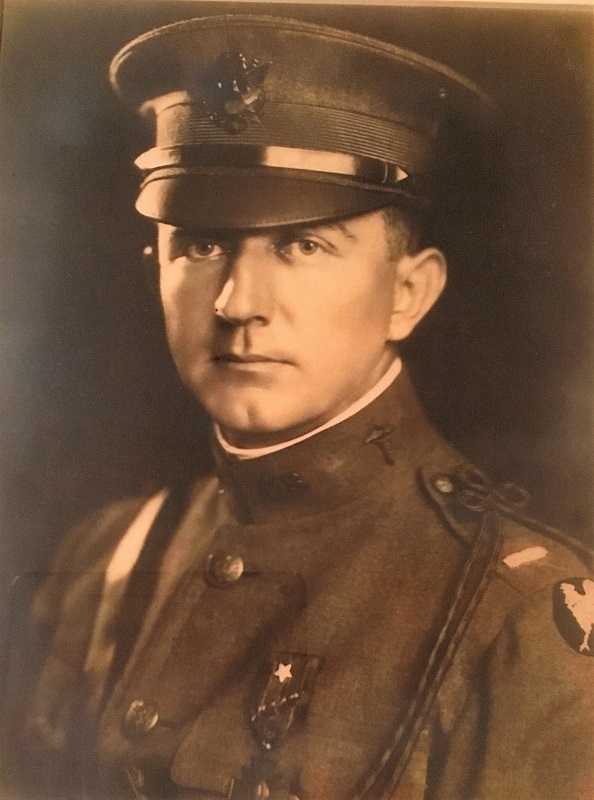 In June of 1916 he chose to enlist and join the Amherst ambulance unit at their training in Allentown, Pennsylvania. 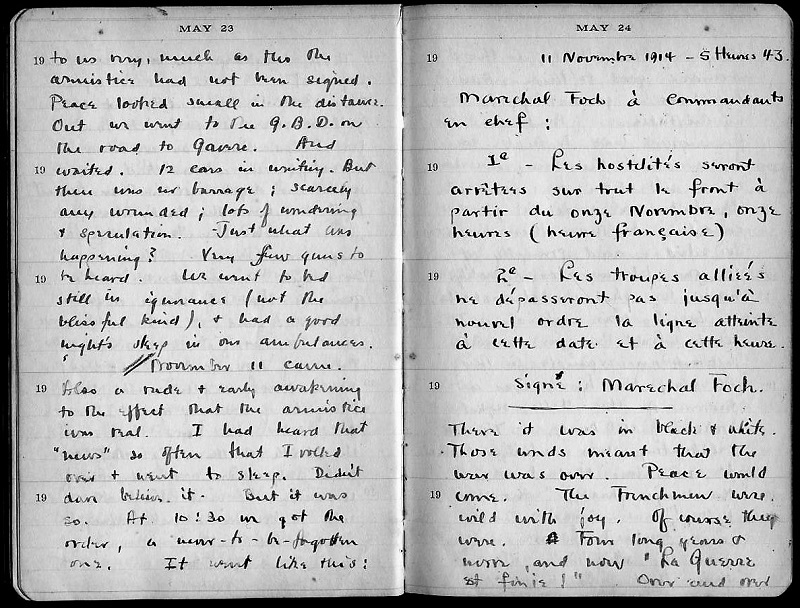 The quotes below come from his diary. It looked to us very much as tho the armistice had not been signed. Peace looked small in the distance. Out we went to the G.B.D. on the road to Gavere. And waited. 12 cars in waiting. But there was no barrage; scarcely any wounded; lots of wondering + speculation. – Just what was happening? Very few guns to be heard. We went to bed still in ignorance (not the blissful kind), + had a good night’s sleep in our ambulances. 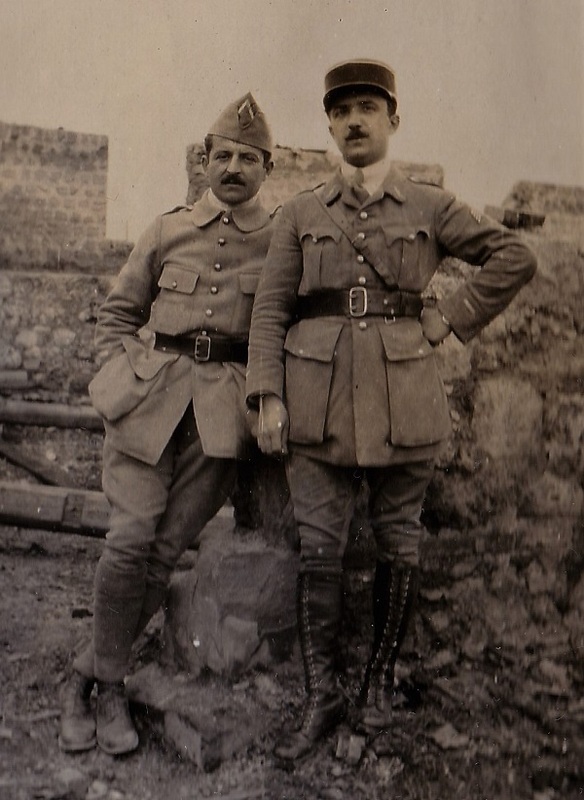 11 Novembre 1914 – 5 Heures 43. 2e – Les troupes allieés ne dépasseront pas jusqu’à nouvel order la ligne atteinte à cette date et à cette heure. There it was in black + white. Those words meant that the war was over. Peace would come. The Frenchmen were wild with joy. Of course they were. Four long years + more, and now “La Guerre est finie!” Over and over they shouted that, as tho it sounded good to them. And it did have a good ring to it – no mistake. But I for one couldn’t grasp the situation. The thing that had happened was so big – so far- and deep-reaching. Here was something that would touch millions of lives in hundreds of corners of the world. And the destinies of nations – how this would change and give new direction to them. What transformations of national character and policy will happen – and what a brand new international program would be inaugurated. I just felt it was a “big” day; and I knew I wasn’t taking in all of its bigness by any means. In the midst of all the joy of the day, I felt a bit subdued, and awed. Didn’t feel like giving any college yells. And it seemed almost sacreligious to go on a party, such as the section celebration was. A noisy affair. It seemed more like a time for taking a long look ahead – very quietly – a time for nourishing great hope + faith. At the time this photo was taken, the unit was known as Section 39. They later became Section 539. At some time in the fall of 1917 they adopted the nickname ‘Black Cats.’ A black cat logo was painted on their Model T Ford ambulances in January of 1918. We’ll have to admit that we weren’t looking forward to Christmas, 1917, with any stupendous enthusiasm. Fact is, as far as possible, we weren’t looking forward at all. Christmas Day came – with no raucous reveille to usher it in – white and clear and snappy, regular Christmas weather. It was just as cold as any other day; but nobody made any biting jests about turning on the steam heat. Everybody had secretly resolved to make it as much like a home Christmas as could be. The “Merry Christmases” sounded as real home made ones. Three men went out to get a Christmas tree with instructions to get it but not to get caught. Then we hurried to church. It was not at all an ordinary sort of church. It was a front room, once a parlor, and now the living-quarters of a French lieutenant of artillery. On the table in one corner was a Christmas tree. The candles on the tree were lighted and in their altar-like glow our Christmas service began. The invocation, in French, was offered by a stretcher-bearer, a Protestant minister before the war. Then we all sang together “Silent Night, Holy Night,” one-half of the congregation using the French words and the other half singing in English. The difference in language did not prevent a real unison. The Christmas story was read in French, then in English. The Frenchmen sang “O come all ye faithful”; and the Americans sang “O little town of Bethlehem.” Together – they in French and we in English – sang, “Hark, the herald angels sing.” The French ex-minister took as the text of his sermon, “Behold, the Morning Star.” Even those of us who knew little French could catch the enthusiasm of his prophetic vision – Christ as the Star of Hope and promise for a darkened world. The American ex-minister, a member of our own outfit, spoke about the Spirit of Christmas and the spirit of internationalism – how the Christmas spirit had brought together a small bit of France and America in that service on that day – and how some time it would bring together the nations of the world in the fellowship of mutual service for all days. The singing by all of “Nearer, my God, to Thee” closed the service. No man of us will soon forget that service. The Christmas dinner came next. I mention only the outstanding features: goose, four fine fat roasted geese, well-browned, you know, product of a most excellent French farmyard; salad, too, with mayonnaise from the hands of a real French chef; all sorts of good things, pie, peaches from California. After enjoying this repast to the full, literally, the Christmas Tree (origin not yet disclosed) was unveiled. It glittered and glistened just as a good Christmas Tree ought to. Even in France you can’t have a Tree without a Santa Claus. And he was there, the same jolly old chap, though in a soldier’s uniform. And within his reach a riotous heap of presents. They were not expensive (a half-franc limit had been imposed) nor were they strictly utilitarian. But they were mirth-provoking – something for everybody, something apropos of his particular foibles or eccentricities. [For example, the] writer was decorated with a tin “Croix de Guerre” suggesting perhaps that it is the only kind he is likely to get. The man in charge of the Black Cats during their time abroad was an Army lieutenant named John Bocock. A 1910 University of Georgia grad (and the son of a well-known professor), Bocock taught elementary school and played semi-pro baseball in Georgia while saving up to go to law school. He got his law degree from the University of Virginia in 1915. He enlisted in 1916 and joined the Black Cats not long after they landed in France. "One might think ambulance work, at best, to be a funeral sort of work, but that is not true. It was rather a work of reconstruction, this snatching of the wrecks of the war from the very jaws of its hell, and carrying them as speedily as possible to a safe place where they might be made whole. We could take our light Fords very close to the line, and we always went along with the infantry; sometimes as far as regimental headquarters, and sometimes beyond. It got to be rather impersonal work, too, though one never got so accustomed to it that the groans were not a continual wear on the nerves. If a man died in the car, the driver did not brood over it; death was one of the ordinary incidents of the work; it might come to any of us at any moment. A broken spring was a serious matter. It meant the impairment of the service; it might mean that the wounded would have to wait, and this must not be. We did no medical work. Our problem was simply one of transportation. We risked our lives, and many men of the Service gave their lives, in the effort to save others. It was sometimes terribly hard, but it was never a gloomy task." 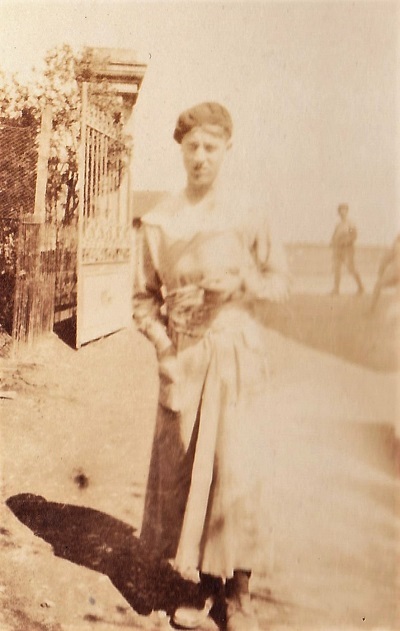 Hugh Hamilton kept this photo in an album after the war. 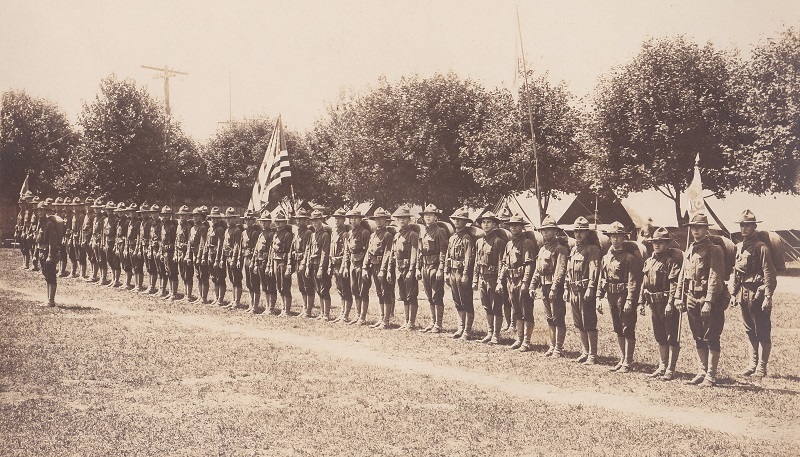 It appears to be a shot of Section 39 taken in the summer of 1917 at Camp Crane in Allentown. (Note: The unit wasn’t called SSU 539 until later on.) There are forty-two men in this photograph. Forty-six Section 39 men sailed to France on the San Jacinto in August. The third man from the right is recognizable as Ralph Whipple, one of the shortest men in the section. The second man from the right is holding a banner that has the letters R, S, and T on it. This is likely an Amherst banner. Hugh Hamilton is to the left of the American flag, directly below the utility pole in the background. 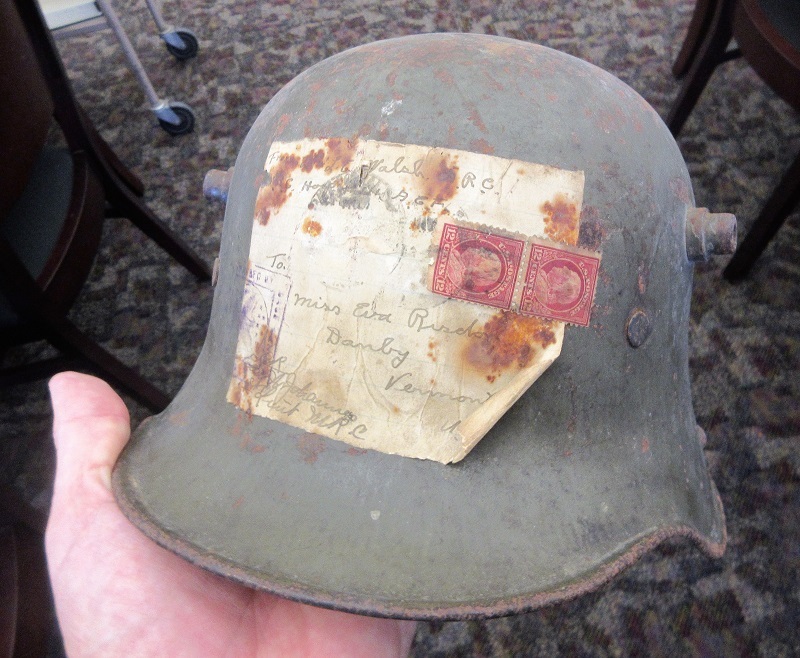 My grandfather, Hugh Hamilton, kept letters, postcards, and other items related to his time in France during World War I. Among his correspondence with some newfound French friends are these four unsigned drawings. They are marvelous. The attention to detail is fantastic. The battle scene drawings have a compelling sense of motion and action. They are remarkable documents. 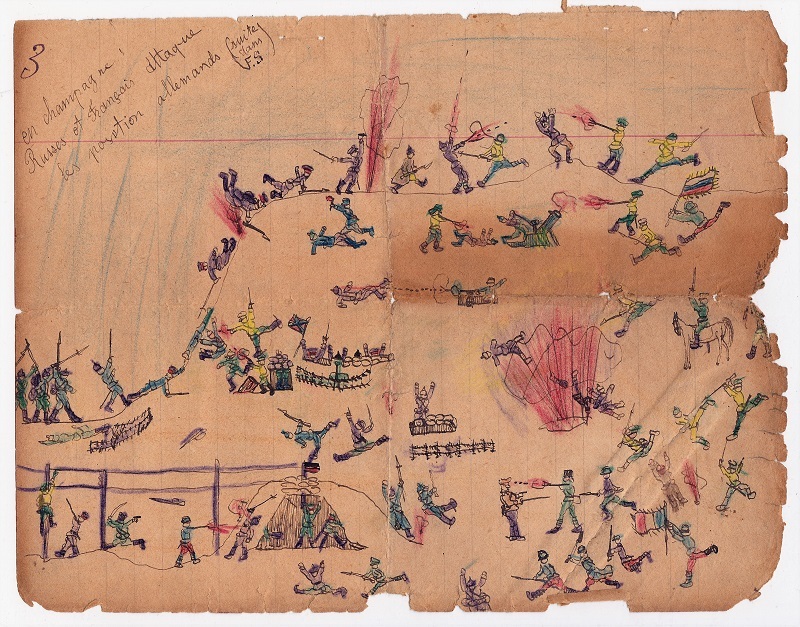 They remind me of the Battle of the Little Bighorn drawings by Red Horse, the Minneconjou Lakota Sioux warrior. Three of the drawings are numbered (3, 4, and 5) and based on that it appears that a few of the series are missing. They are drawn ink on lined paper that is now a light brown. Bright colors have been added with what looks like colored pencil. Soldiers of many countries (France, Russia, England, and Germany) are depicted, as well as men from different military units. Notably missing are American soldiers (or ambulance drivers for that matter). One theory about the artist is that it could be Roland Le Brun, a French orphan ‘adopted’ by my grandfather’s ambulance unit, the Amherst Black Cats, at some point in their journeys around the Champagne region. 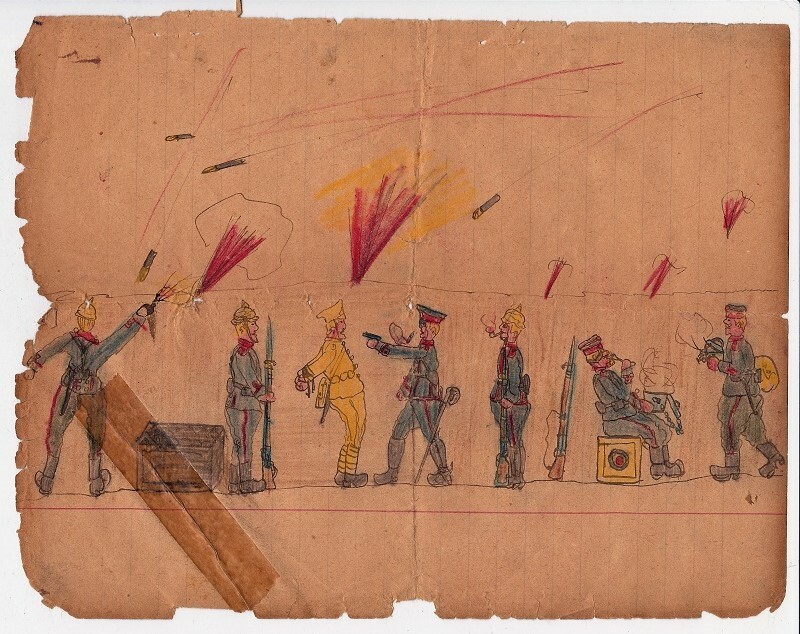 This unnumbered drawing shows seven soldiers in a trench that is under heavy artillery fire. An officer (presumably French) with a pistol threatens a prisoner in bright yellow as life goes on for the other soldiers who are observing or eating or firing a weapon. Artillery shells fly and explode nearby. A rip in the paper is repaired by tape. Identified with the number three and with the text “en champagne: Russes et Français attaque les position allemande (suite dans F.S. )” in the upper left hand corner, this hillside battle scene contains dozens of soldiers advancing and shooting at each other while others are blown up or surrender. Note: The Chasseurs Alpins (the 47th Division) was the group that the Black Cats were assigned to starting in October 1917 yet for most of their time abroad they were attached to the French 5th Division. What do you think was meant by the parenthetical comment: “suite dans F.S.”? 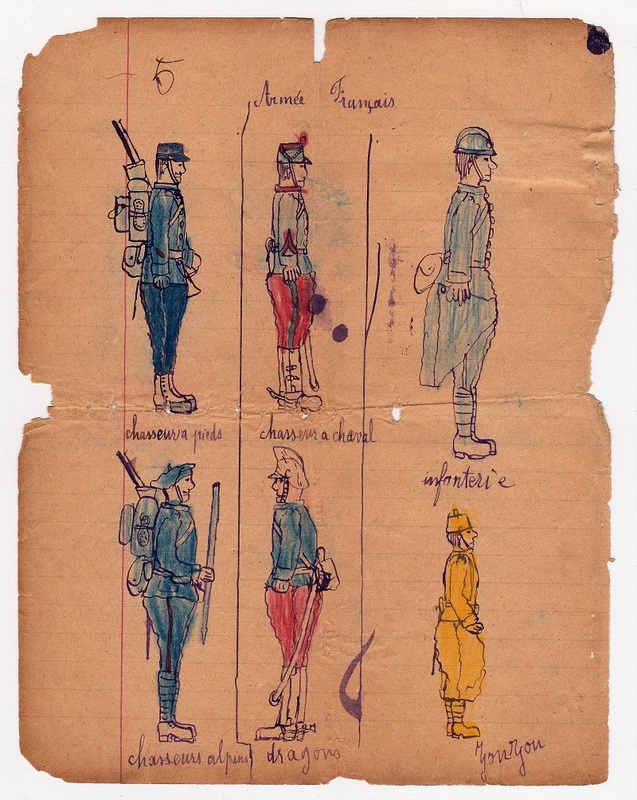 Were there World War I soldiers who wore yellow uniforms? 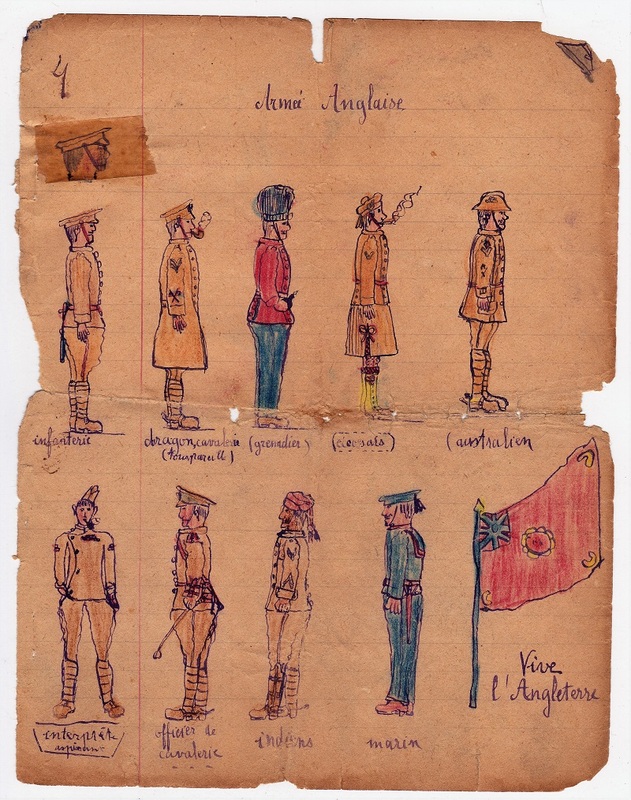 Can anyone identify the flag in the “Armée Anglaise” drawing? I am very excited to announce that artist Dorothy Simpson Krause (the same artist who did the artwork for the cover of “The Writing 69th”) has completed the artwork for the cover of my upcoming book, “The Black Cats of Amherst.” For more on Dot Krause please visit her web site or like her Facebook page. My writing continues and I am close to completing a first draft. The target date for publication is May. 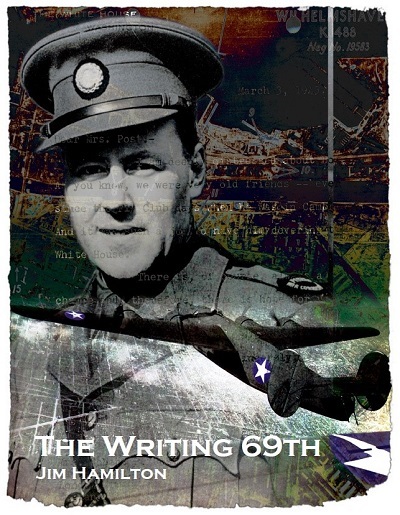 I intend to publish this book through my publishing company, Green Harbor Publications, and offer it for sale (as I did with “The Writing 69th” as an on-demand printed book through Lulu.com. 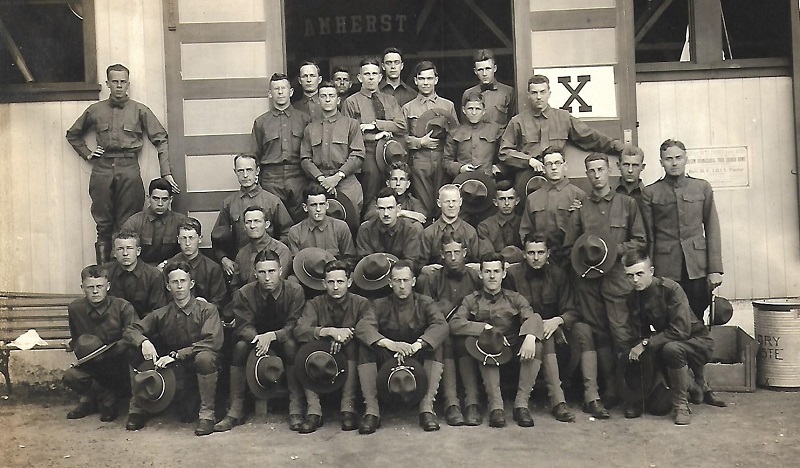 I would also like to announce that I will be on a panel called “Amherst at War” during Amherst College’s reunion festivities this Memorial Day weekend. By way of diversion + something different S.S.U. 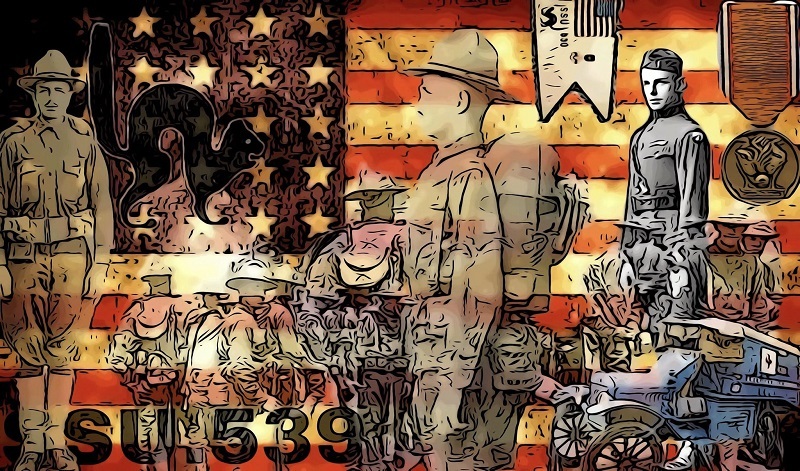 539 becomes histrionic + puts on a dramatic masterpiece. The child of Roger’s brain. Composed April 9 – produced April 10. Title: “The Nut’s Revenge” or “Who Poisoned the Ice Cream?” A tragic tragedy + comic comedy – all in one. First scene in Bill’s Drug Store, Amherst. Boys of R.O.T.C. singing etc. very college. Dean Burns after Amelia Philips (the beautiful Peckham) Brown (with German sympathies) also in the race. Dean drinks Pigeon’s milk + acts the fool successfully (Vielbig). Next the Infirmary + diarrhea – litter drill + charming nurse (Stevens). Poison. Prof. Lancaster (Clarke) as bomb-expert. Last: The poisoner discovered – Dean. Fine acting by nuts: Whipple + Hinch. S.L. 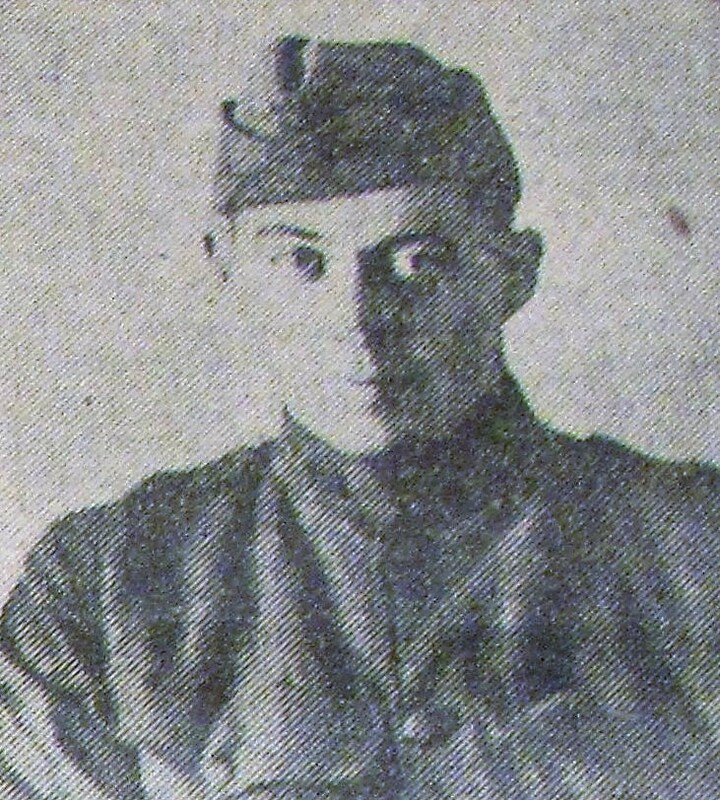 = over-military, Captain Burnett, with the Loot’s trick hat. 503 + 312 invited. Crowded house. Loud applause. Large success. Howell Shepard kept a cast listing (see below). Photographs of the two cross-dressing actors (Stockham Peckham as Amelia Philips and Rufus Stevens as Nurse Violetina Rose) were published in the Black Cat’s unit history. 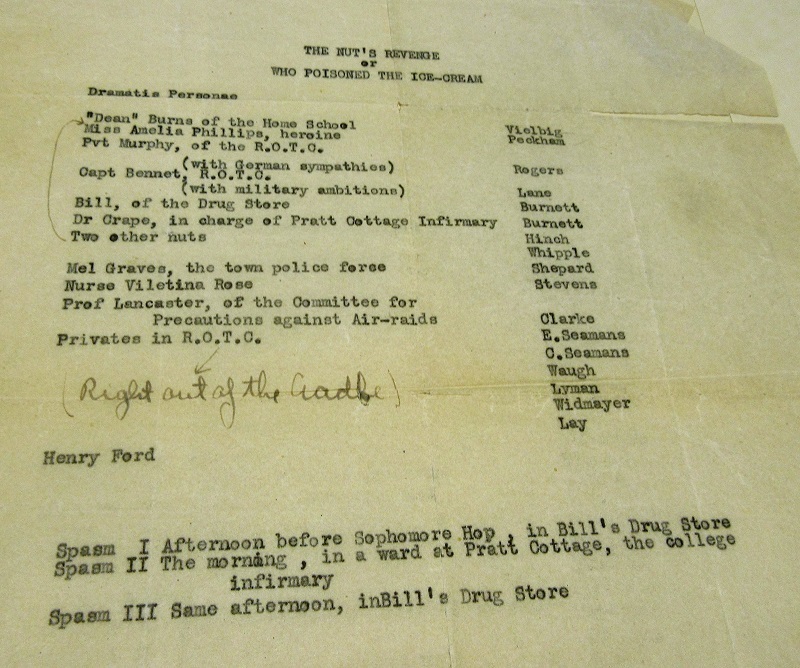 Notes: The Black Cats shared lodging and a mess with SSU 503 in April and May 1918. Section 312 was a military transport unit that was part of the Quartermaster’s Corps. What to say? Is there anything Eastery in the present. No – but there will be in the future. Speak on “After the Good Fridays come the Easters.” Today is a prolonged G.F. [Good Friday] – death + suffering. But the Easter of tomorrow with its world = [its] resurrection will come. A Big Faith for a Big Cause indeed. – We often get tangled up in trifling things. We forget the bigness of the war. We think of it in terms of ourselves. We think + live in the present = the present is big, the future is small. All our own present discomforts + difficulties are magnified. The War is bigger than we – the Future is bigger than the Present. Langemarck used to be a town of 7-8000 population. Now it isn’t a town at all. I know, because I looked for it in the A.M. and it wasn’t there. Mud-holes, shell-holes – wet and water were there, but the town wasn’t. Absolutely not a thing. Somebody said that a pile of debris 10 ft high used to be the church. And right by the car was a mutilated pill-box. As for other signs of humanity or any other kind of life – it simply wasn’t there. Even a sparrow or a sumach-bush would have been welcome. Not a house – not a tree – not a bush. Only a flat, desolate, dreary, empty waste of nothingness. A place fashioned for the damned – a dwelling-place of hopelessness and lifelessness. Four years of war made it so; it was the old No Man’s Land – well-manned too – an inhuman spot, with the life shelled out of it and death shelled in. If anybody thinks of war only in terms of glory, let him be handed a ticket to this spot. Rather good thing to keep it as it is after the war, in case anybody forgets what war really is. It’s a place that would strike terror into any soul. Dante should have seen it. It shames the lowest hell of his imagination. The thing that had happened was so big – so far – and deep-reaching. Here was something that would touch millions of lives in hundreds of corners of the world. And the destinies of nations – how this would change and give new direction to them. What transformations of national character and policy will happen – and what a brand new international program would be inaugurated. I just felt it was a “big” day; and I knew I wasn’t taking in all of its bigness by any means. In the midst of all the joy of the day, I felt a bit subdued, and awed. …it seemed almost sacreligious to go on a party, such as the section celebration was. A noisy affair. It seemed more like a time for taking a long look ahead – very quietly – a time for nourishing great hope + faith. These are sobering thoughts, coming from a minister in time of war. Yet his message of hope and faith is inspiring, even when that hope is sometimes misplaced. We all know that in two decades after Stoddard Lane wrote these words the world would be fighting another massive war again. And despite this there is still hope, even in the darkest hour. If a man like Stoddard Lane, who lost his wife at a young age and who saw the evils of war, if he could keep hoping, then we all can hope. That is the lesson to take from his words: “After the Good Fridays come the Easters.” There is always hope. I mentioned a few months back that when I first saw the Black Cat’s banner it was in such delicate condition that the archive personnel did not want to remove it from the box. I could only take a picture of it all folded up. Since then, the banner has been assessed by a textile conservation company. They provided the pictures you see here of the front and back of the banner. This is the first time the full banner has been seen by human eyes in decades. 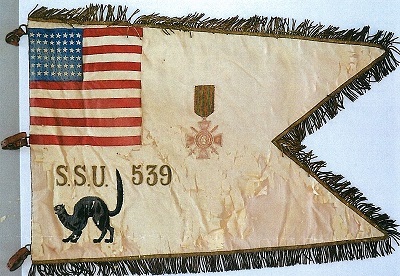 The front of the banner (or more accurately a guidon or military pendant) has the SSU 539 unit designation and the Black Cat logo embroidered beneath an American flag. 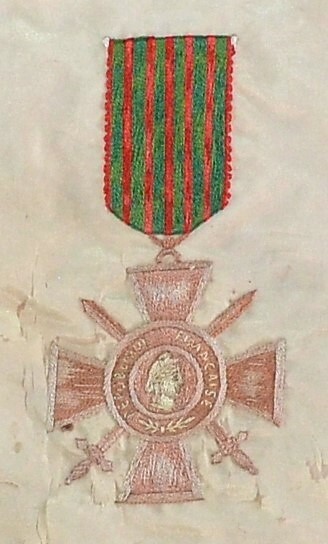 A Croix de Guerre medal is depicted in the center. 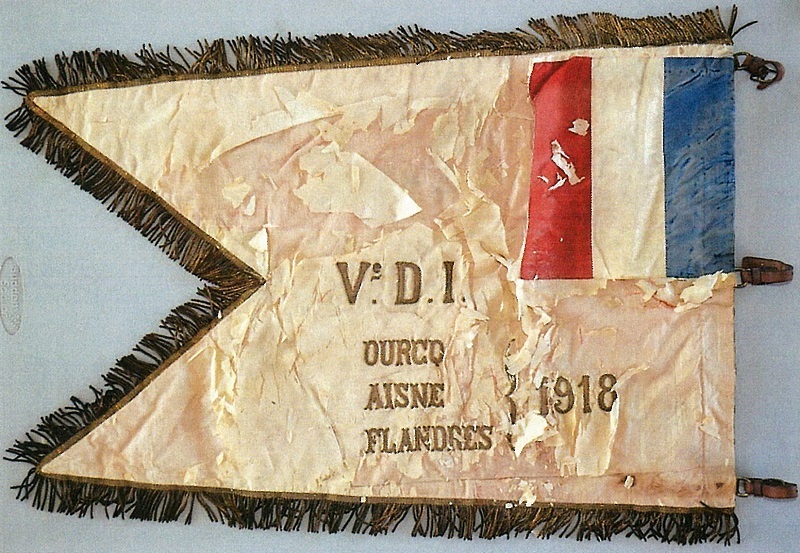 The back of the SSU 539 ambulance unit banner has a French flag as well as the names of the three major engagements that the Black Cats participated in with the French 5th Division Infantry in 1918. Work is underway to raise funds for the restoration of this historic item. If you would like to contribute to that effort, please contact me and I will send you details. His full name was Jean Baptiste René Lucas. 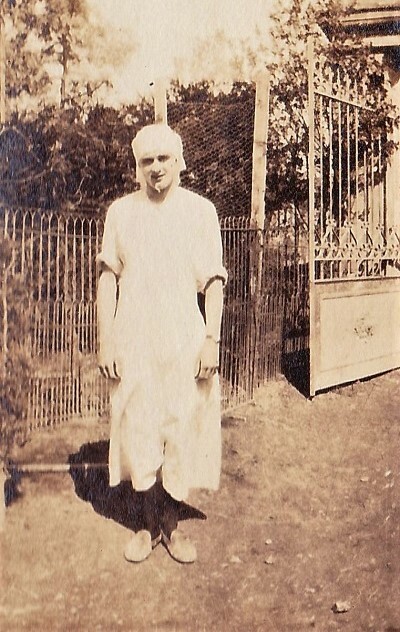 He was born on June 10, 1887 and died on July 17, 1961. His parents were Auguste René Lucas and Marie Cécile Gabrielle Bascle. He got married on January 4, 1909 to Léonie Longepied. They had at least one child, a daughter named Christiane who married Pierre Maurice Bellet in 1933. He was a business school graduate (HEC - Hautes Études Commerciales). He was made a Chevalier de la Légion d’Honneur (Knight of the Legion of Honor) in 1936. He was originally from Neuilly-sur-Seine (near Paris) and lived there for many years. He died in 1961 in Cornillé-les-Caves (Maine-et-Loire), a village close to the city of Angers. His wife died in 1980 (at which point she was living in Angers, Pays de la Loire). If by any chance you can help us connect with any of his relatives, please let us know. 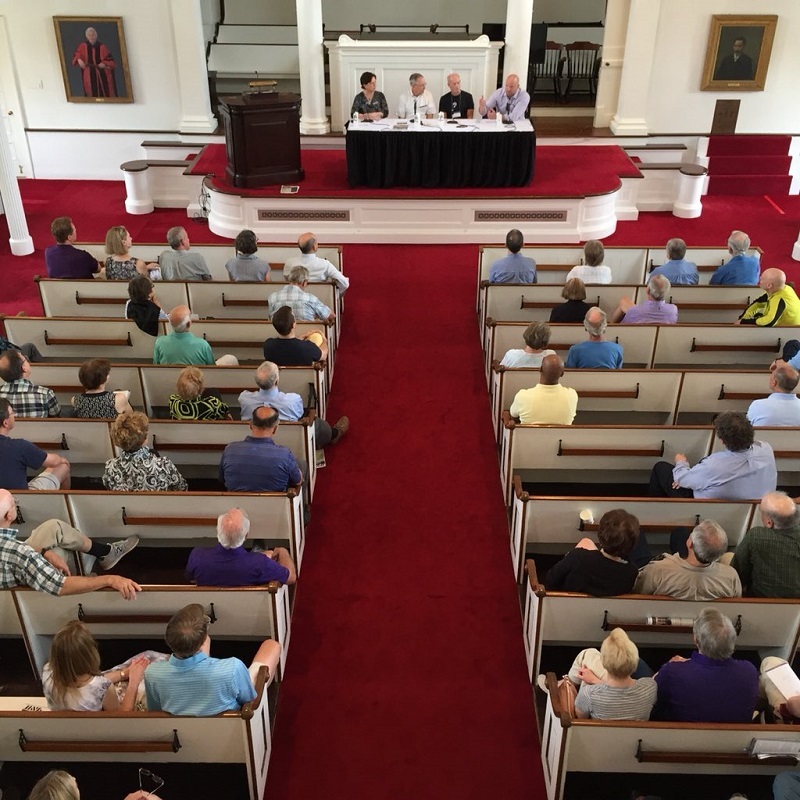 May 26: A link to the video of the Amherst in War panel session that took place at the Amherst College reunion on May 26th. July 21: I participated in an Author Showcase at Ventress Memorial Library in Marshfield, MA on Saturday July 21. Here's a link to a Facebook video of me reciting A 'Letter to Dad' by Joseph Lyman (you should turn up the volume a bit). November 1: I spoke at Jones Library in Amherst, MA on the evening of Thursday November 1 at 7:00 pm. November 14: I gave a presentation at Ventress Memorial Library in Marshfield on Wednesday November 14 at 7:00 pm. November 30/December 1: I spoke at an Amherst College event called ‘Amherst Today’ that focused on Amherst College history through World War II. January 17: I spoke at the State Library of Massachusetts in Boston, MA on Thursday, January 17th. 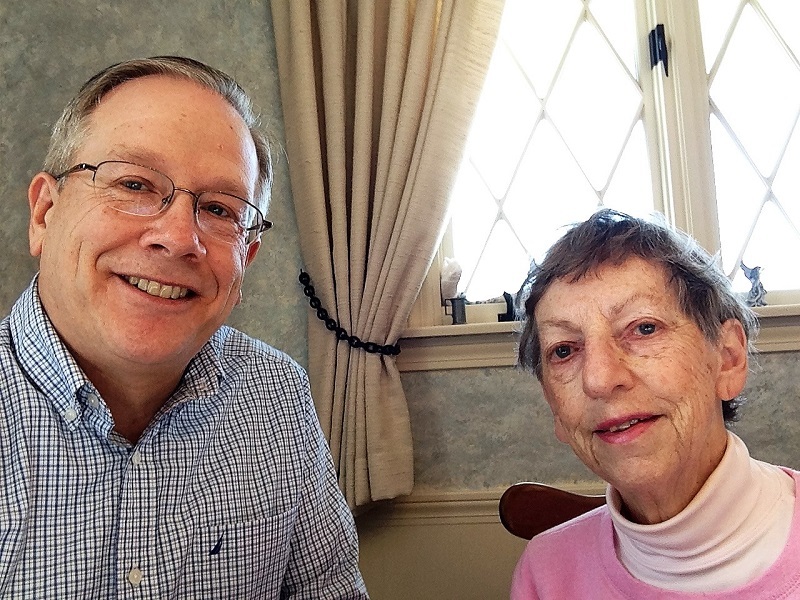 January 17: I gave a presentation at Sunrise of Braintree in Braintree, MA on Sunday, January 27th. August 6: I will do a presentation for the Duxbury, MA public library at the Village at Duxbury on Tuesday, August 6th at 2 pm. The book ‘The Black Cats of Amherst’ is available for purchase via print on demand at Lulu.com. Let's Hear It for the National Archives! 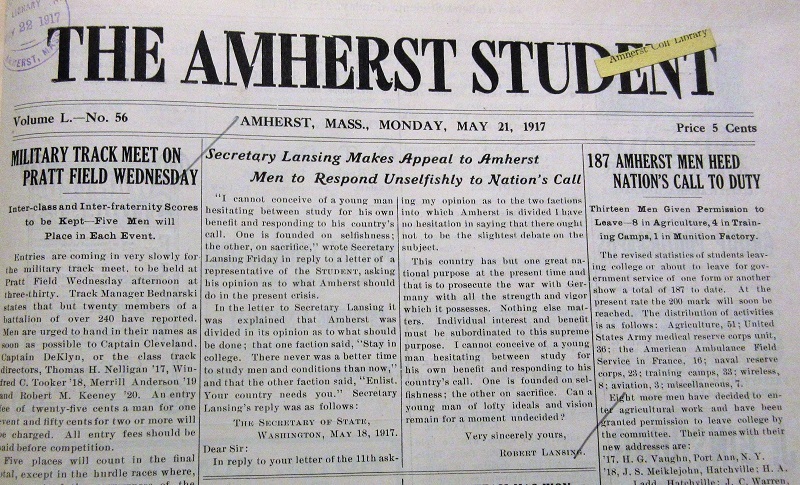 In the spring of 1917, my grandfather, then an Amherst College freshman, wrote a letter to Robert Lansing, the U.S. Secretary of State and an Amherst College graduate (class of 1886). I knew about the letter because Lansing’s response was among the many items my grandfather left behind after he died in 1988. It occurred to me one day that my grandfather’s letter to Lansing, which he had not saved a copy of, was probably somewhere in an archive. I learned that Lansing had donated his papers to Princeton University but soon discovered that these did not cover the time period when my grandfather had sent his letter. All signs pointed to the likelihood that the letter was among Lansing documents in the National Archives. 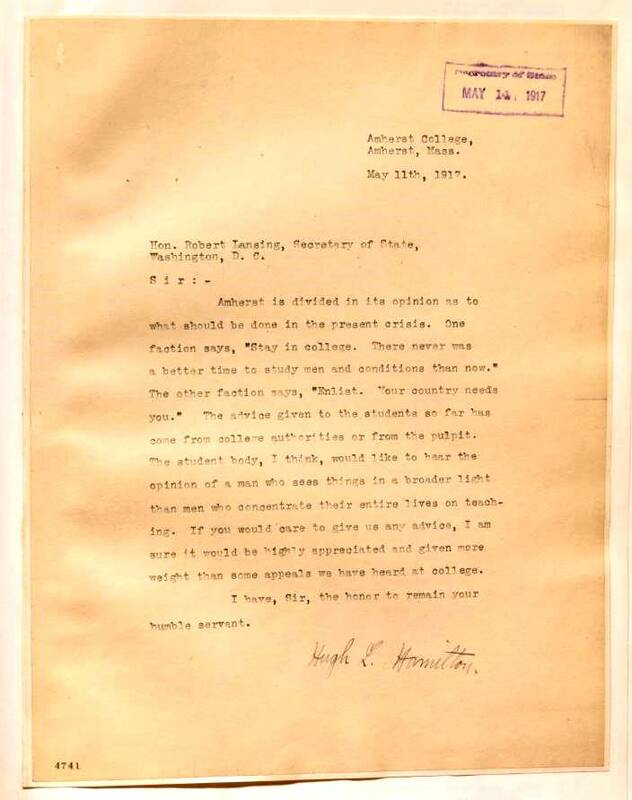 [Question]: I have in my possession a May letter 1917 letter written by Secretary of State Robert Lansing to my grandfather, Hugh L. Hamilton, who was a freshman at Amherst College at the time. Lansing's letter responds to my grandfather's question about whether he should join the army. Lansing's response is yes, he should, and it's eloquently written. My question for you is whether my grandfather's letter to Lansing is in your Lansing archive (reference http://hdl.loc.gov/loc.mss/eadmss.ms010227). Lansing's response is dated May 16, 1917. My grandfather's letter would have been received a few days earlier. 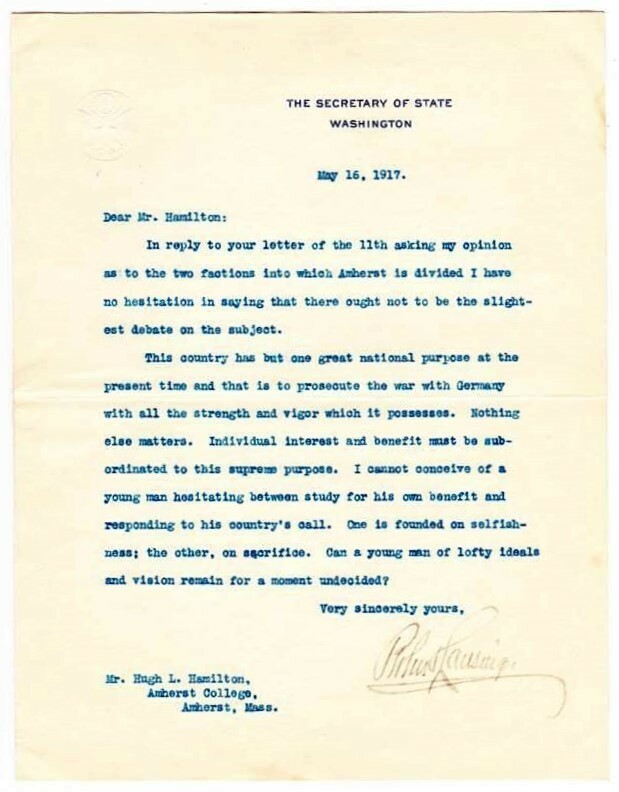 I've attached a scan of the letter your grandfather, Hugh L. Hamilton, wrote to Robert Lansing on 11 May 1917. The original is located in container 27 of the Robert Lansing Papers http://hdl.loc.gov/loc.mss/eadmss.ms010227.3. Please do not hesitate to contact me if I can be of further assistance. Now it’s true that I was well-prepared and I had explored other options before submitting my question, but to get a response within a couple of hours, on a Saturday no less, was extraordinary. Even now, a couple of years later, I am still in awe. When I completed ‘The Black Cats of Amherst,’ I gathered some items together, including the Robert Lansing letter, and donated them to the Amherst College archive (whose staff, by the way, has been monumentally helpful as well). I suppose I could have given the Lansing letter to the National Archives, but of course they already had Lansing’s own copy (plus the original of my grandfather’s letter). I do feel, however, that I owe them a large debt of gratitude, so in closing I would like to thank the National Archives for their amazing speed and helpfulness. I think it is also a testament to the advances that have been made by libraries and archives over the past twenty years in digitizing their collections and becoming more savvy electronically. Keep up the good work! Friday, November 22, 1918: King Albert enters Brussels. So do we. Not synchronously, tho He beat us to it making his triumphal entry with large body of Allied troops, including two companies from the 148th Rgt, 37th div. American, who were said to have created quite an impression – Also some of the 74th, 5th Div. French. – We drove up before the imposing Bourse (with national Motto emblazoned on it “In Union there is Strength”) squared away to the right and wound up in front of the American “Y”. Others apparently had located this spot, for it was congested with allied soldiers, largely “Tommies”. Returned prisoners were having chocolate doled out to them in tin cans. They looked as tho they needed nourishment – a forlorn, ragged bunch, clothed in raiment of many colors, and mixture of uniforms of every nation under the sun. Many were Britishers, clad in their black prisoner uniform. Some wore Boche hats, civilian pants etc. Some had stories of great hardship to tell – draughtsmen (in lieu of horses) from Lille to Brussels – nothing but cabbage-soup and black bread to eat. Some had been turned loose to find their own way to Brussels – they woke up to find their guards gone. Others claimed that they fared as well as the German civilians – none too well. We did not find any who were enamored of the life of a prisoner. Perfectly willing to be on the way home. We wandered up into the Place of the Hotel de Ville – Gothic thruout, and a very picturesque square it was. And crowded – one solid mass of human beings. How long they had been waiting I can’t say, but they were expecting the king. Then with jingling banners, representing various guilds, stood about the entrance. The gendarmerie in the best clothes were there in force. We decided to wait, with eye peeled on the crimson bedecked canopy over the door of the Hotel de Ville. Every now + then the crowd moved + we moved with it. Every so often someone would faint + have to be got out. Have never felt as helpless – power to move of one’s own free will was gone. At last he came. And the crowd cheered itself hoarse – and the band struck up the National air ending “Vive son Rois” – we’re cheering, right hearty, too. No counterdemonstration as had been predicted. Just one long roar of welcome. The king looked very dignified and worn. He received the plaudits in a simple way, as tho he respected the crowd. No theatrical stuff at all. He looks like a real man. The prince and princess where with him. The crowd dissolved, but it did not stop cheering and singing. It took to parading and dancing. It snake-danced, and ring-around-a-rosied – and did everything it could think of to express joy. All this in the main boulevard. Anybody could start a procession and it gathered recruits as it went along. Allied soldiers were centers of gathering. Scots (and there were some huge chaps) seemed favorites – always clustered about. Americans (only a few of us) came in for our share. Folks stopped to talk with us – to thanks us – to bid us welcome. Almost everyone smiled, and cried “Vive l’Amerique” to us. No introductions necessary. Numerous offers of hospitality. One young couple saw us looking sort of lost. (We were searching for the cathedral) and insisted on establishing themselves as our guides. We saw the cathedral (nothing remarkable by night). The royal palace + gardens (Boches did not use the palace – American Relief + Belgium Red Cross – the wing was now reserved for [illegible] of the war by the queen’s request), and the huge Palace of Justice, very impressive by night. We also saw the Kaiser’s effigy, hanged. Of course the café’s were crowded, as well as the streets. And it was a treat to see streets lit up – and shop-windows attractively full and decorated. Flags of all nations everywhere. – We got another viewpoint from a young cynic (Belgian) who told us that it was just an ordinary fête – people rejoicing not because of peace but because they hadn’t had a chance for so long. Brussels, he said, gave the Boches the cold shoulder for the first few months – after that it took them into its society, etc. We wonder just how loyal Brussels really was. Its appearance did not manifest any suffering – a well dressed town, apparently well-fed. It did not remind me a bit of war. But of course we only saw the surface – and we did not see the poorer element. That’s where the shoe pinched. Prices had dropped, but were still sky-high. During the occupation they had been like this: Frs 450 for 100 kilos of potatoes. One cup of chocolate allowed every six weeks. One cake of soap per family per month. Sugar not so scarce in Brussels, but scarce enough – 25-30 frs a kilo. Candy was one franc for one chocolate cream – 20 frs for a cake of Peter’s. Brussels seemed more like Paris than any city we have seen. Of course it is a small edition but a de luxe one. It goes down as an unforgettable place – full of people + spontaneous joy + lights + trolley cars – a regular city in full swing. We were sorry to have the recollection marred by the story of the next day. A woman who was supposed to be unfaithful to her husband in favor of the Boches, was set up on the Bourse steps, stripped by the crowd + chastised by bats and other missiles. A coarse mob “justice” for which there was no excuse. – Must confess that we left Brussels wondering whether the story of Belgium’s plight had not been exaggerated. We only wondered – don’t know enough to state. "Xmas 1918 was not so difficult as Xmas 1917. The war is over, you know. That made a difference. Besides, the day was so busy with events that homesickness was crowded out. We wouldn’t let it in. No time for moping – None for feeling sorry for one’s self. Besides Christmas 1919 will in all probability be a home Xmas. ‘Tis a cheering thought. "And one couldn’t help remembering that this Xmas was probably the best Xmas that the world has ever seen. A time when even the sorrow-stricken could try to lay aside private grief and rejoice with the general rejoicing. 'Peace on Earth' – at last. May it be a lasting one – forever. Surely Christ ought to be honored this year as never before – for we know better now what Peace and Goodwill mean, what their value is. Surely Christ and the Kingdom ought to have a better chance in the world, now. Surely the League of Nations will give an opening. "Or are we going to slip back into the old way of nationalism + materialism? It is surprising how little grasp of the international idea many of the Frenchmen have. They don’t seem to get it. They think + talk in terms of France. Perhaps we are just as one-minded – many of us, with our silly prejudices against “Frogs” and Belgians. Faith often falters. "Has the war with all its lessons taught us that of international cooperation. Are we ready for the family of nations? It is a bit difficult to think of British + French in the same household – or even ourselves + British. Yet we must have this gathering together of nations, unless we want the ghastly tragedy of 1914-1918 over again." I had the good fortune recently to visit Museum Textile Services (MTS) in Andover, Massachusetts. MTS is where the Black Cat’s banner is being worked on. In 2018, funds were raised by alumni and the college to support this effort and now the conservation project is fully underway. The banner is being cleaned and stabilized so that it may be put on display. 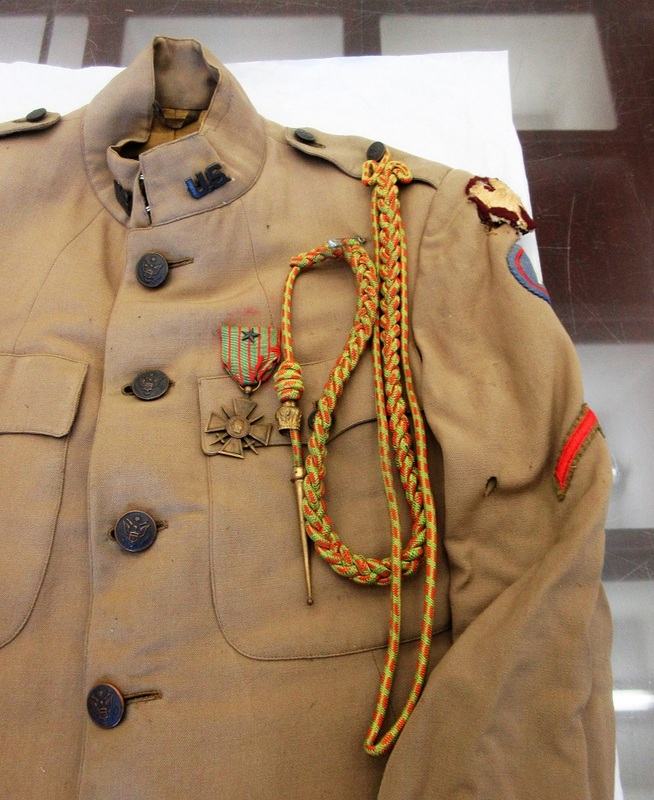 Along with the banner are several ribbons, a fourragère, and a Croix de Guerre with two palms. For reasons that I will explain below I believe that this is the Croix de Guerre that was awarded to the unit. One part of the repair work on a silk banner of this type is similar in a sense to putting together a jigsaw puzzle. The larger pieces of delaminated silk are being carefully replaced into the open gaps. The entire banner will be sandwiched between a fine netting to support the deteriorated silk. In addition to the actual Croix de Guerre there is an embroidered Croix de Guerre on the front of the banner (see below). 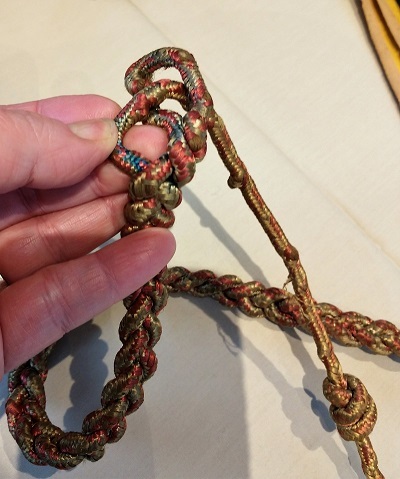 The fourragère is now a faded olive green and a lackluster crimson red, but the old colors can still be seen in areas not exposed to sunlight, and frankly, they are psychedelic (see below). Long ribbons accompany the banner. Their colors suggest that they represent the national colors of France and Belgium. Three leather straps were used to attach the banner to a pole. Based on the condition of the banner, MTS believes that it was not exposed to combat conditions and likely was displayed indoors on the pole at an angle. This suggests that the banner was made after the unit returned to the United States. The two palms on the Croix de Guerre indicate that the recipient had been cited two times in French dispatches at the army level. I don’t think that any individual Black Cat was cited in this fashion, and so I believe that this Croix de Guerre must be the one that was awarded to the unit. The conservation project will be completed in time for the 100th anniversary of the Black Cat’s return to Amherst. 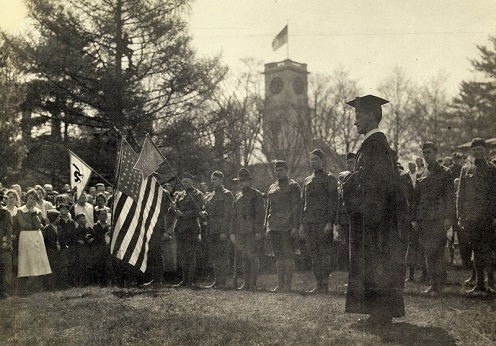 In April of 1919, they marched from the Amherst train station to the college to present their colors to Amherst College president Alexander Meiklejohn. 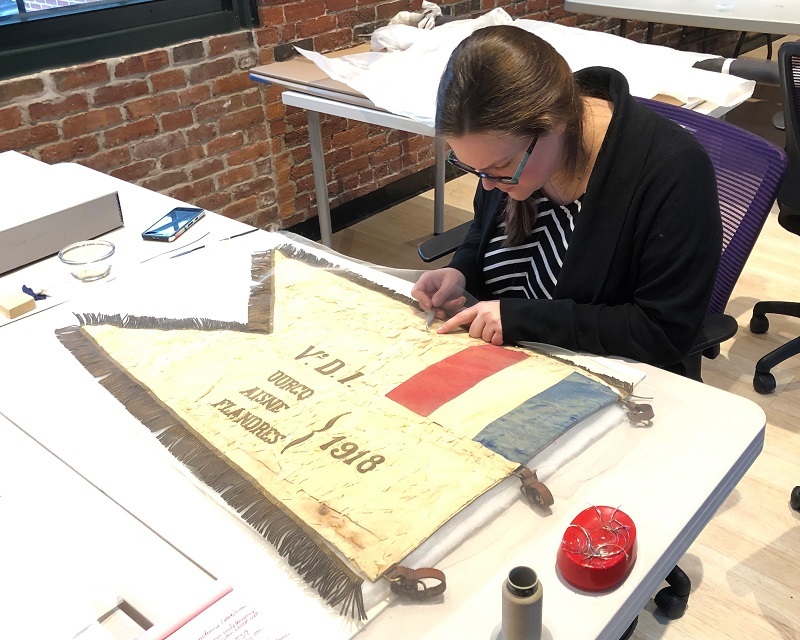 The banner will be displayed in Frost Library at Amherst College starting at the end of March and will be on view at graduation, reunion, and through the end of the summer. Photos of the Black Cat's return to Amherst show about twenty soldiers in formation. Three are holding flags or banners. The largest is an American flag. Flanked on either side are an Amherst and a Black Cat banner. There is no sign of the larger Black Cat banner that is currently being worked on. This is likely because it was presented to the college at a later date. By the way, the smaller Black Cat banner also resides in the Amherst College archive, but it is in poor condition. 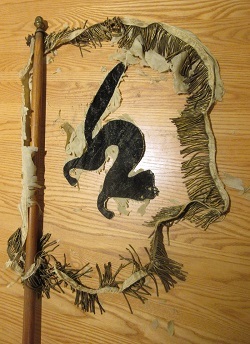 The banner’s fringe and the black cat remain, but the rest of the fabric has disintegrated. 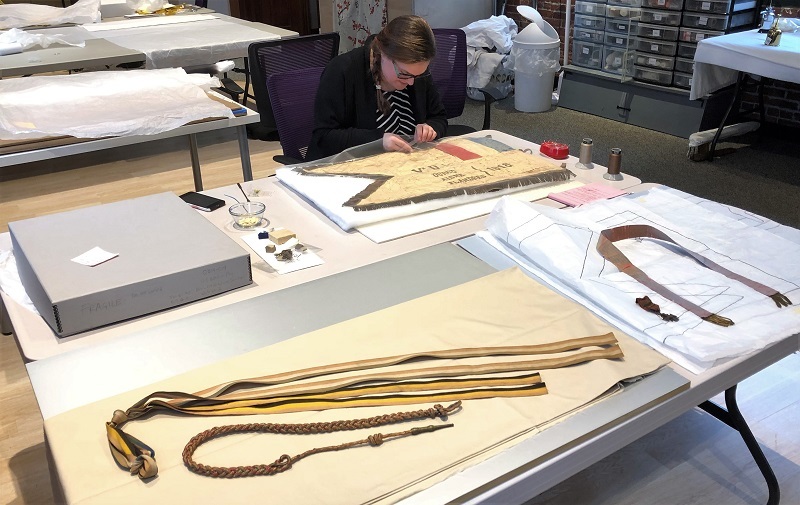 Many thanks to our friends at Museum Textile Services for their conservation work on this project! For more on Danielle’s perspective see her blog entitled The Black Cats of Amherst Banner. French artist Sébastien Lefebvre created the artwork show below to honor the Black Cats. He was inspired by the images and photographs that recorded their time in Europe. We are grateful to our French friend Magdeleine Dod for introducing Sébastien to the Black Cats. Merci! More on Sébastien's artwork can be found on his web site lefebvrecollagimiste.com. 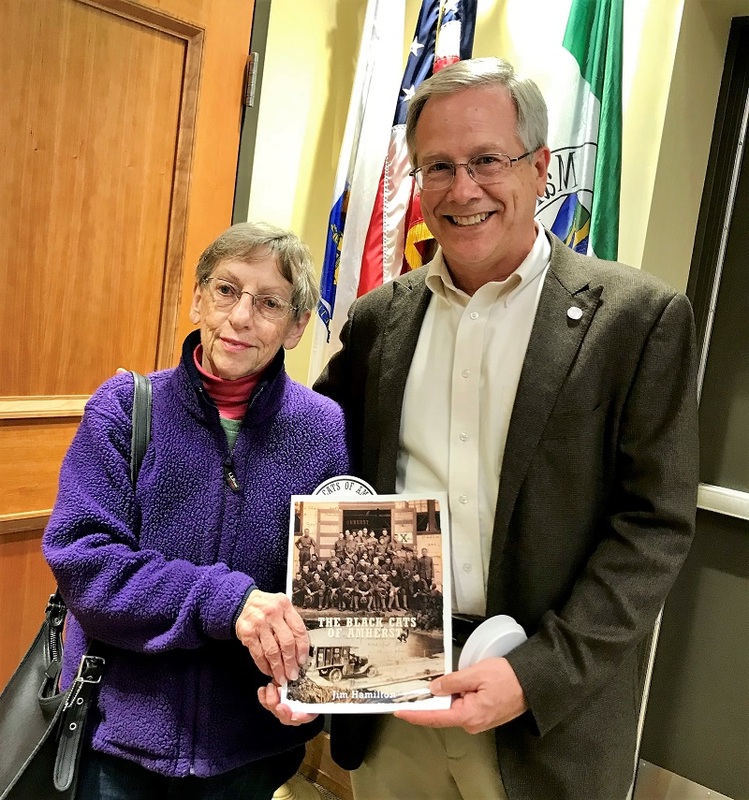 On March 13, 2019, the Amherst Association of Vero Beach hosted a talk by Jim Hamilton, the author of The Black Cats of Amherst. 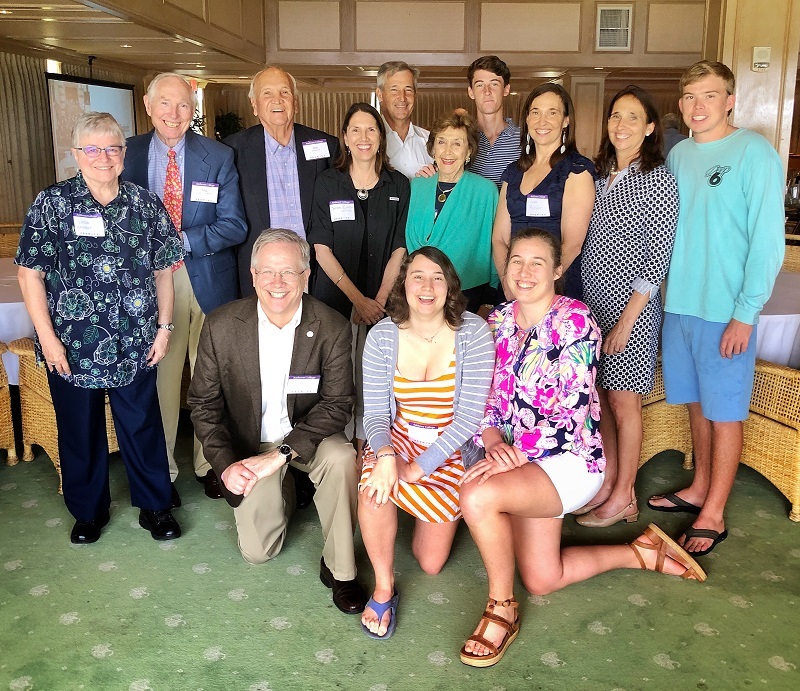 At that gathering were thirteen descendants of Black Cats including two sons, Nick Evans (Amherst College class of 1952) and Donald Riefler (Amherst College class of 1949). Ed Warner (Amherst College class of 1954) wrote this description of the event. An exhibit of Black Cat memorabilia is now on display at Amherst College and will be on view through reunion. 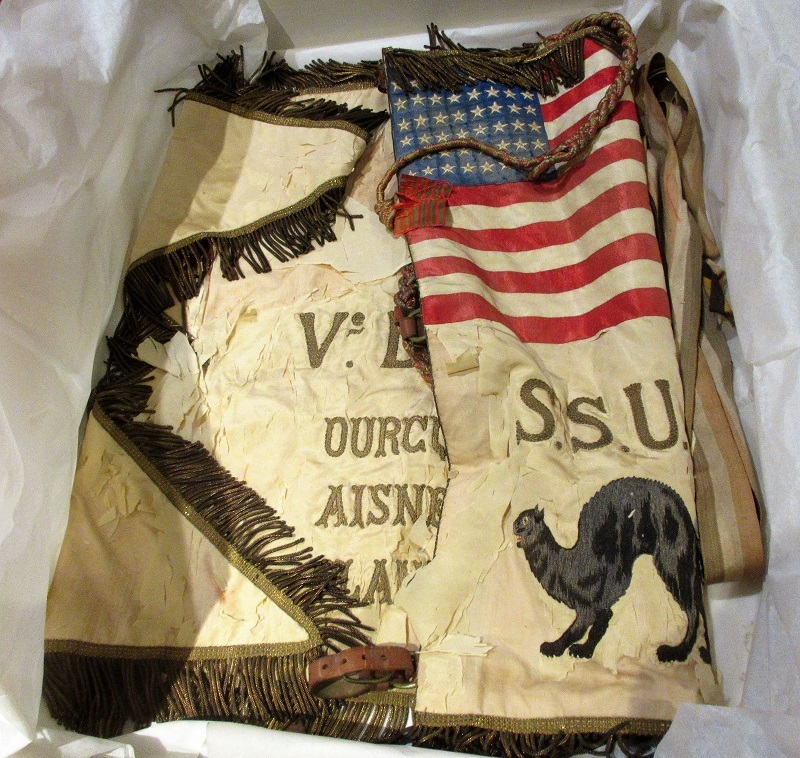 The display includes the Black Cat’s banner, which has recently been cleaned and conserved. 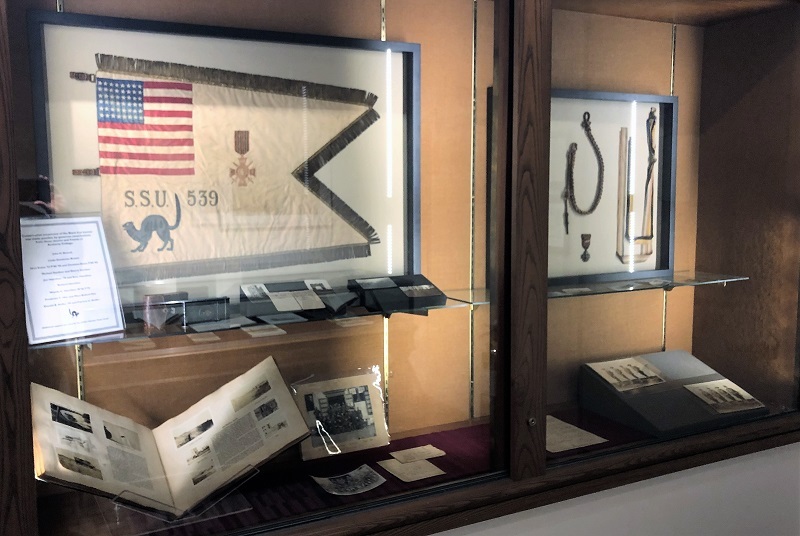 Other items include photographs (plus some of the cameras that took them), documents, the Black Cat’s unit history, and the Croix de Guerre medal and fourragère that were awarded to the unit. The display is downstairs at Frost Library right in front of the entrance to the college archive.